Step 1. In a large bowl, whisk together eggs and milk. Add flour, baking powder, bicarb and lemon juice and whisk until smooth. Step 3. Colour each bowlful of batter with the food colouring to create your desired colours. I chose the classic colours from the rainbow song – red, yellow, pink, green, purple, orange and blue. Step 4. In a large frypan, melt a little of the butter over gentle heat. Beginning with one colour, spoon batter to create four pancakes. Cook for 1-2 minutes, until bubbles appear on the surface. Flip and cook for a further minute. Remove to a plate and keep warm. Repeat with remaining coloured batters. Serve in stacks with maple syrup and fresh fruit. 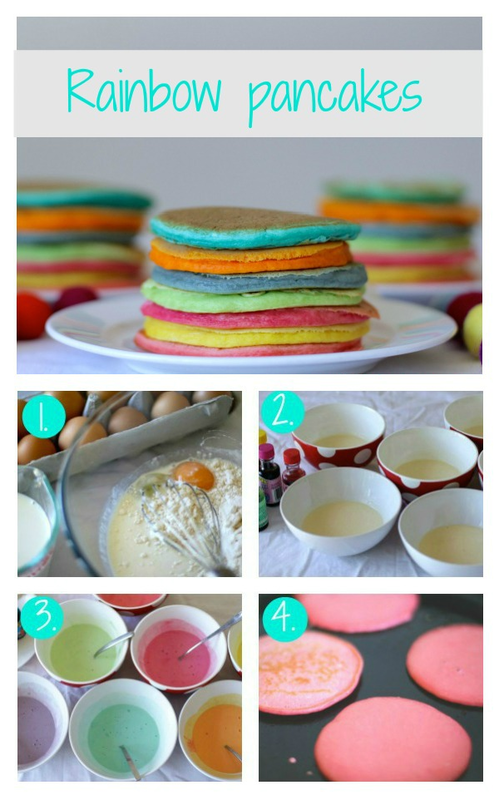 These pancakes have a boost of raising agents – flat pancakes won’t show up the colour spectrum nearly as well. You could make a simplified version with fewer colours. Seek out natural food colourings if you are concerned about additives. Sprinkle freshly cooked pancakes with fresh lemon juice and a dusting of caster sugar. Red velvet pancakes are a nice twist on plain ol' pancakes – try serving these for Valentine's Day or just to show your family how much you love them. This recipe was created for Kidspot, New Zealand's best recipe finder by Greer Worsley, who blogs at Typically Red.